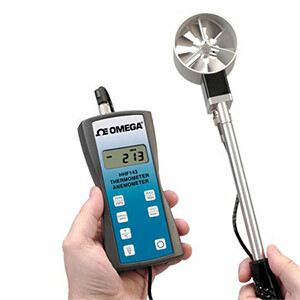 The OMEGA™ HHF143 rotating vane anemometer series are high-quality instruments providing highly accurate air velocity and temperature measurements in harsh environments via a userfriendly and intuitive interface. Applications include indoor air quality, process control, flow hood monitoring, and many other applications where precise air flow and temperature measurement is required. 참고: Comes with NIST certificate (No data points), vane sensor [25 or 70 mm (1 or 2 ¾") depending on model], 3 extension rods (flexible, straight and w/handle), 1.5 m (5') cable, 3 "AA" alkaline batteries, hard carrying case and user's manual. For units with a protective boot add "-PB" to the model number and $55 to the price. For units with USB communications add "-USB" to the model number and $195 to the price. For units with a 0 to 5 Vdc voltage output add "-V" to the model number and $225 to the price.